Summer can be full of sweet surprises and simple moments that you come to cherish and savor. This past weekend held several such moments. Friends came into town from Austin and from Dallas to celebrate a wedding here in Houston. The celebration allowed for several reunions, a chance to introduce friends to some local spots, and conversations full of catch-up. I met with Austin several friends to check out City Centre's new Grub Burger Bar on Friday night. Oh burgers. A few years ago, I conducted a burger tour of Houston on my personal blog and visited favorite burger dives and hotspots. Grub Burger Bar easily scores among top burger spots in Houston. Stay tuned for a future post detailing Grub....complete with photos. I promise to stave off the hunger until I pull out the camera. A practice in self control, surely. Following dinner, our gang enjoyed live music on the green and a cluster of wily children--dancing and running and chasing about. We, feeling like children ourselves, and tiring of future, corporate talk, decided on dessert. 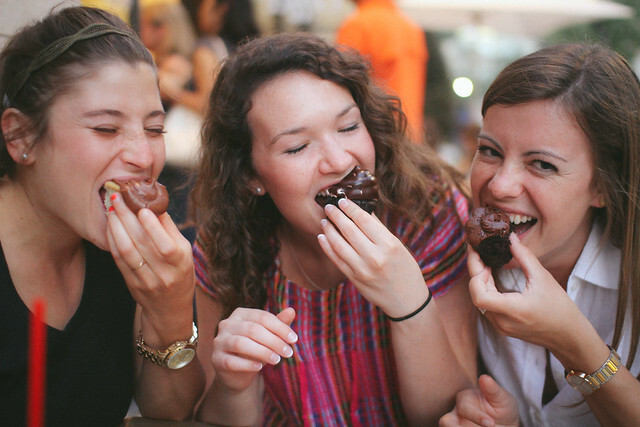 We hit up Sweet and found ourself faced with a multitude of choices: macaroon vs. cupcake? Chocolate vs. vanilla bean? S'more vs. Red Velvet? 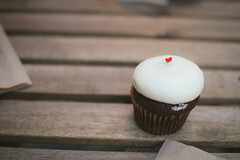 While I am typically not big on luxury cupcakes (when homemade desserts clearly taste of love and vanilla and home), I was not at all disappointed by Sweet's selection. 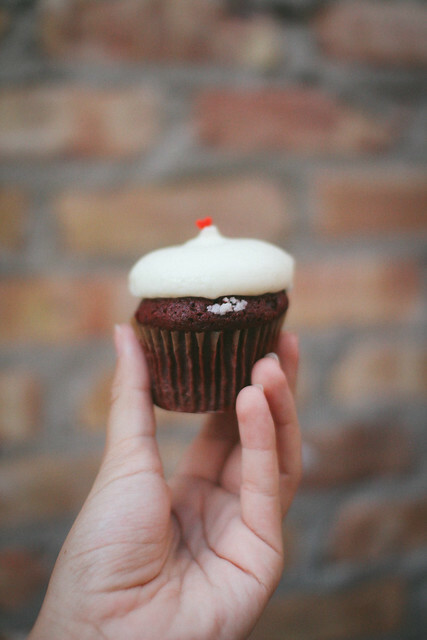 My red velvet cupcake met the expectations of red velvet cupcakes everywhere: rich, soft cake, and even richer, saccharine sweet cream cheese icing. 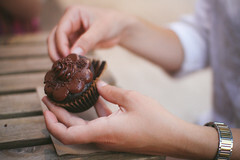 Jenn opted for a classic vanilla bean cupcake with chocolate icing, and she claims she picked better than I. (Perhaps she is right...you cannot beat a classic.) 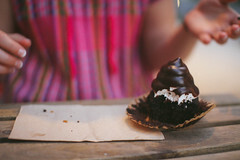 Mere adventurously chose a s'mores cupcake, devoured the sweet treat and then licked her fingers. 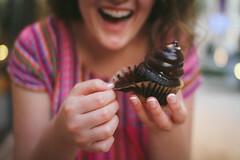 And sweet Alex cheerfully order a gluten-free chocolate cupcake with chocolate icing. Truly, it was sweet.